Learning how to dry my curls has been a long process of frizz and frustration. There is so much to consider; towels, plopping, clips, air drying, hair dryers, diffusers, and the actual mechanics of how to position your head. Embracing my curls has taught me that experimentation is part of the process of learning how to get great hair. 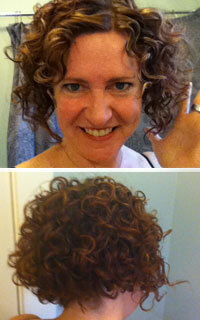 Through that experimentation and frustration, I have also had many amazing curl revelations. Most poignant was the discovery of my Holy Grail products, finally understanding dew points and becoming an avid ingredient label reader. They were all thrilling curly moments. Drying my curls has been one of the longer learning processes. 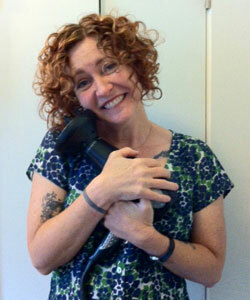 Only recently, last week to be exact, made it to that moment of wonder with my hair dryer and diffuser. How Do I Dry My Curls? 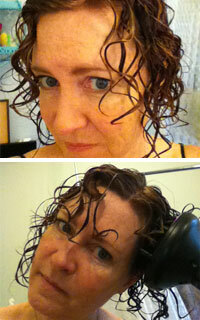 It wasn't a case of being lazy about learning a foolproof method for drying my hair. It was just my assumption that I had already found what worked best for my curls. I would start out with all my styling products in my hair. I would then scrunch my hair with my Curls Like Us Cloth. I thought my next step should be plopping, but I never really felt like I had perfected the plopping method. I would always end up with crushed, crazy curls. I don't have a lot of hair, and it is cut in a curly bob, so for the moment I knew that I would get better results by skipping the plopping method. After letting my styling products set for 5-10 minutes, I would be ready to dry my hair. There was a rush of decisions to make and I knew them by heart. The hair dryer temperature settings, the size of the diffuser, how to hold the hair dryer with the diffuser to get my curls to dry without causing too much frizz, and lastly how long to dry my hair. When I first started trying to use a diffuser, my attempts were comical. The mere mechanics of it defeated me right away. The diffuser kept coming off my hair dryer causing my curls to blow around mercilessly. By the end of the second day I couldn't take the diffuser crashing to the floor any longer. I bought a new ionic hair dryer that came with a diffuser, a very exciting purchase. I turned that baby on and realized I needed to make some serious decisions. I was going to have to experiment with the hair dryer settings and time management. Too hot of a setting would speed up the drying time but caused a lot of frizz. The same problem happened with the high setting. Too much force and frizz was inevitable. A few bad hair days later I figured out the warm temperature setting on low was my best bet. I was finally winning the fight with my frizz. I had figured out the first components of the drying challenge, now I was on to what position should my head be in? I decided I needed volume but didn't want to sacrifice the clumping that I had achieved with my styling products and the Curls like Us Cloth. 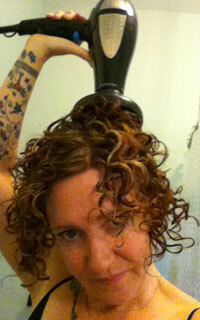 I was holding my head upside down and gently putting my curls in the diffuser, working my way around my head. I tried to scrunch a little bit, but knew too much touching would cause frizz. I dried my hair until it was about 85 percent dry. At this point I felt like I was pretty close to getting this process right, but I was still getting some frizz and my clumping was breaking up. It wasn't so bad that I needed to start over, but I finally got to the point of realizing I was having more bad hair days than I could tolerate. So like every curious curly out there, I started to look on Curltalk and YouTube for drying techniques and tips. Read More: Can You Pull Off the Pretty Pixie Cut? After some searching, I found The Pixiecurl Method. Thanks to some Pixiecurl Method threads on Curltalk and Waterlily176 's video, I was seriously tempted to try this new method. Would it work for me, and could it really make a difference? I had read about it before, but never really paid that much attention to it. I decided the experiment was on. I co-washed my curls, added my favorite products, scrunched with the towel and got my hair dryer and diffuser out. I put a section of my curls in the diffuser with the hair dryer OFF, and then moved the diffuser up to the crown of my head. I didn't go all the way to the scalp because that seemed to smash the root volume. It also created a weird bend on the top of my curls — not a good thing. With diffuser almost to my head, I turned the hair dryer ON for about 45 seconds using the warm/low setting. I then turned OFF the hair dryer. I continued this all the way around my head, stopping when all the sections were almost dry. It took two passes around my head to get my curls 85 percent dry. If you have super thick hair this may not be for you, because it would take forever. I did not hang my head upside down through out the whole process. This experiment was a huge curl revelation for me. I had no frizz, great clumping and super curl definition. It really worked! Why hadn't I thought about it before? My hair needed to stay still and have the curls scrunched (kind of like plopping) and baked gently until almost dry. I still got lots of volume AND kept the precious clumping. A tricky look to achieve with my hair. My life hasn't been the same since I embraced experimenting and discovering my many moments of curly joy. I really love all my curl revelations, and now the Pixiecurl Method is another great one to add to the list. What was your most significant curl revelation?